The saga of the scooter has had a happy ending. In a previous post, I described my conflicted relationship with my Fly scooter as I was putting it by the road with a For Sale sign. That very day I got a call from Kate Redgate, a singer/songwriter who lives a few blocks away. I had heard about her but never met her. She now owns the scooter and I am so happy it went to a fellow artist who will use it much more than I did. Please visit her website and check out her music. She's great! Even better, I now have a bicycle. I went all out and purchased a new Schwinn. Schwinn named this particular model a Jenny and mine is named Jenny Jo. I was looking for a one syllable second name and decided on Jo for my childhood heroine, Jo March from Little Women. She is perfect! She has seven speeds which means she doesn't go terrifically fast which suits me just right. I use her for trips to the post office, library, and farm stand and then extend my trips with rides along the sea wall and into the more open spaces of Newbury. Riding Jenny Jo is both physical—I'm so happy to be getting exercise as I move along— and emotional—I am both completely in the present and deeply connected to the childhood me who rode around the streets of Rahway, New Jersey. 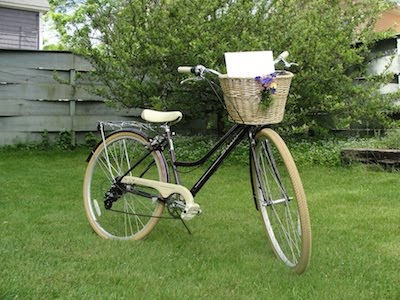 what a beautiful bicycle & love her name, must read Little Women again one day ! I reread Little Women a few years ago. I still loved the characters and the story and cried when Beth died, but I was surprised at how many preachy passages there were. Do recommend rereading it.